Purple this time, roasted with some extra virgin olive oil and a sprinkling of pink Himalayan salt. 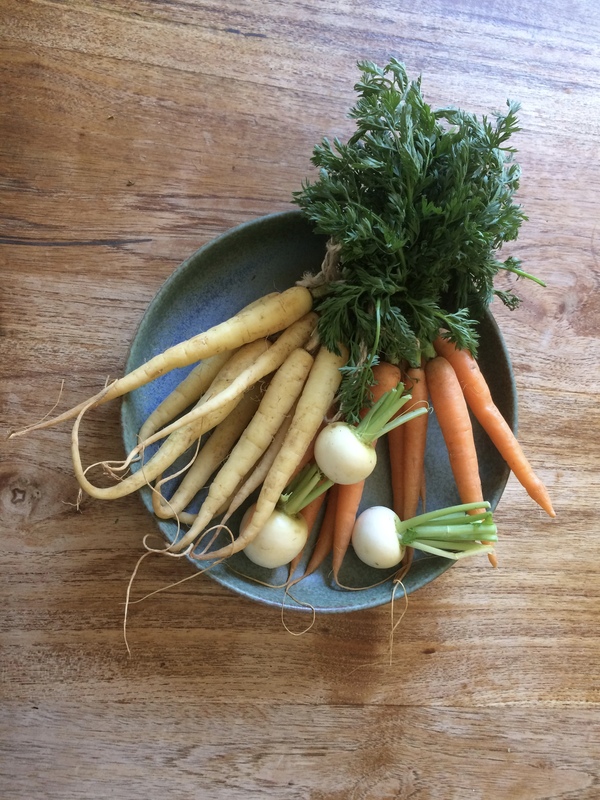 Orange, white or purple, these little carrots are just so lovely to look at…and eat of course. I also managed to get some little turnips (see above) to roast alongside kumara and carrot. A bit of an expense, but I could not resist these, with their incredible colour and shape. They added a real richness to a pasta dish. With an extra day off, I enjoyed lunch at Egmont Street Eatery, where I had the Nduja salami, taleggio, fontina cheese and fig toasty with house pickles. So good. I could not resist picking up a packet of mini sized Leeds Street Bakery’s salted caramel cookies, a Wellington institution and possibly the best cookies ever. Salty, sweet, chewy, you can see why they are world famous in Wellington*.